If you enjoy a loyal crowd of people who never miss your parties, you’re doing something right. Clearly, you know how to entertain when your gatherings become the talk of your social circles. One element of your success is most likely your bar. However, if you find that your bar is simply a place to serve drinks and not much more, then you could take it up a notch with a home liquor display that impresses the eye and invites your guests to stick around. Do You Own a Home Liquor Display that Creates a Buzz? 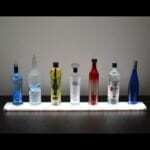 Home bars come in many configurations and sizes. They can be simple dispensaries of adult beverages or they can become destinations. Long, tall counters with seating usually capture plenty of folks during your party. 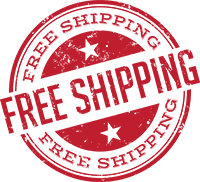 But even those makeshift stands in small rooms can generate a buzz among your guests if you put your liquor on a snazzy display shelf or two. Attractive bottles arrayed on shelves lighted from within will certainly start excited conversations as your friends admire your classy bar. The more professional your bar the more opportunity you have to create an exquisite home liquor display. Lighting is everything when it comes to encouraging the right mood for your gathering. 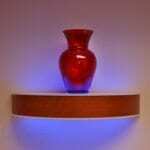 Liquor shelves illuminated from below the platform offer several benefits. 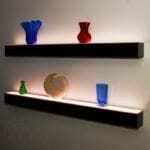 First, you gain additional bar lighting without creating glare. The softer LED lights cast a radiance by which to mix your guests’ drinks, so you can dim or switch off overhead fixtures. Next, the contrast of shadows surrounding the glowing displays inspire a bewitching mood. 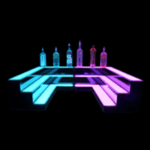 Additionally, you can fascinate your guests with a custom program of rotating LED colors beneath your collection of liquor bottles. 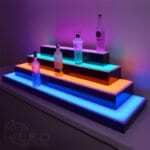 An illuminated home liquor display can only improve your guest’s appreciation for your entertainment prowess. Whether you choose a floating shelf behind a small bar or a large customized arrangement, you’ll keep them coming back party after party. Whether you’re a socialite who loves throwing parties or one who simply enjoys a quiet happy hour at home, you need a home bar. 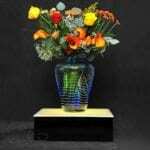 This special arrangement can be as minimal or as expansive as your space allows. But one thing both types of layouts share in common is the home bar shelf. As a marketing ploy, many liquor producers use fancy bottles to attract your attention. It’s a crying shame to hide these pieces of art under a counter or in a closed cabinet. Rather, you should proudly put them out for admiration. 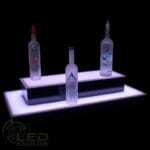 A cool LED lighted bar shelf on top of a small bar makes attractive bottles practically come alive. For a long, sweeping bar, multi-tiered sets of lighted bar shelves not only wash your liquor display in the glow of many colors, they generate delighted compliments from your party guests. 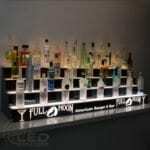 Beyond the beauty of a unique home bar shelf illuminated from within, these shelves offer practicality, as well. Subdued lighting in your home’s party venue, be it a man cave or general entertainment area, makes for a comfortable ambiance. It also makes it a bit difficult to see what you’re doing at the bar. But when you place your liquor selections atop lighted display shelves, you can easily find what you need without twisting up the dimmer. 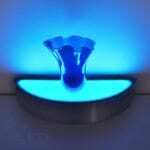 The LED lights provide islands of gentle illumination around your stock, never disrupting the mood of the gathering. You can work your mixing magic without skipping a beat. Is your home bar due for some enhancements? 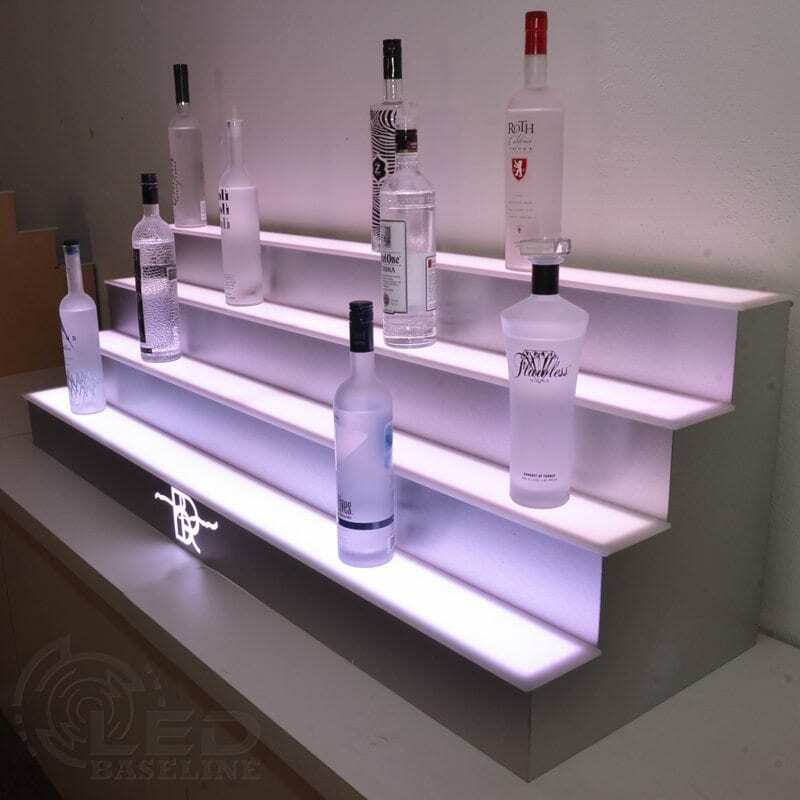 By adding lighted home bar shelves to your decorating scheme, you’ll impress your guests and create a relaxed environment for socializing with family and friends. 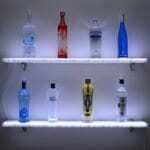 You can also incorporate LED shelves as part of your bar lighting system. 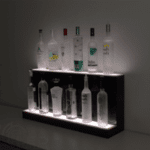 Either way, you’re sure to enjoy a lighted bar shelf in your home. 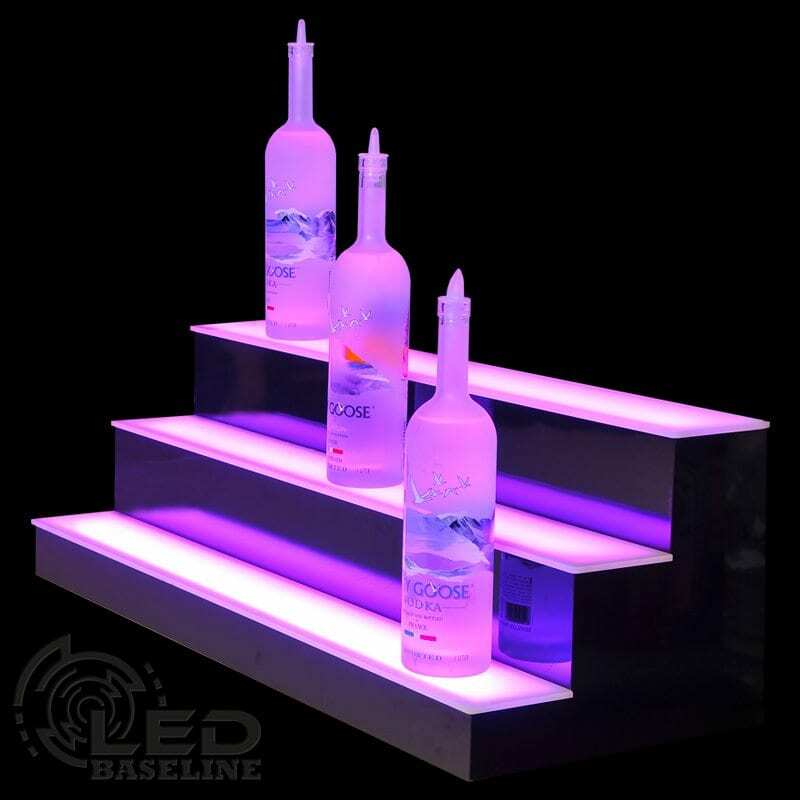 Order yours today from LED Baseline. It is easy!